In this free math worksheet, students must solve problems on geometric progressions. Problems require students to identify terms of geometric progressions and geometric series, to find missing elements, find geometric mean, and complete problems and applications of geometric series. 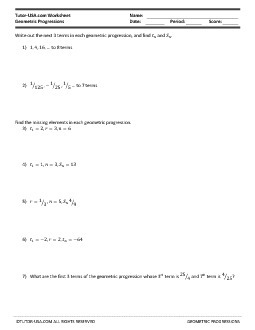 Write out the next 3 terms in each geometric progression, and find tn and Sn. Find the missing elements in each geometric progression. 10) What is the geometric mean of the 2 numbers a and b? 12) An automobile purchased for $3 000 depreciates 12% every year in value. Find its value at the end of 5 years.